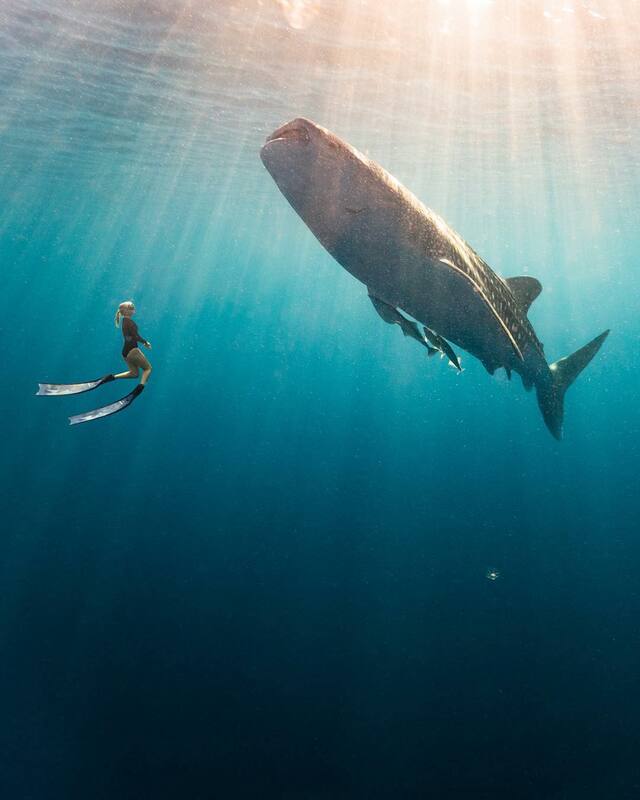 "Swimming with these gentle giants" by photographer Travis Burke. I held my breath and dove down toward the darkness. Deep below me I could see whale sharks emerging as they made their way near the surface feeding on plankton. As I turned around, I saw this scene with beautiful rays of light casting down through the water from the early morning sun. Peering through the lens, I snapped a couple photos before starting my ascent back to the surface. Dive Master and Marine Biologist Brinkley Davies shared her knowledge and passion for these sharks with me during our 15 hours day on the boat. These whale sharks lack natural predators, but in recent years they have been listed as an endangered species due to shark finning, and other anthropogenic pressures such as fishing operations and plastic pollution. There is so much we still don’t know about these majestic creatures and it would be a shame to lose them forever. 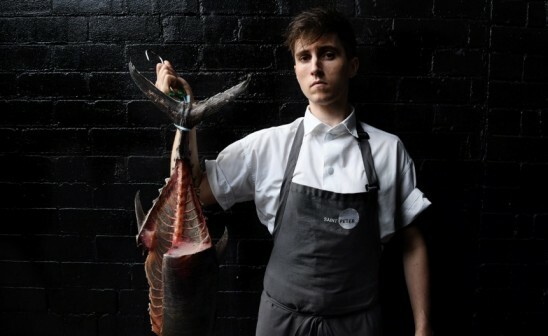 Little things like limiting our use of single use plastics, supporting sustainable tourism and saying no to shark fin soup will go a long way in protecting these and so many other animals that have been around for millions of years! In a place where many people would easily resort to accepting more money to catch, kill and sell these animals fins, these fisherman have chosen to live in harmony with these animals. 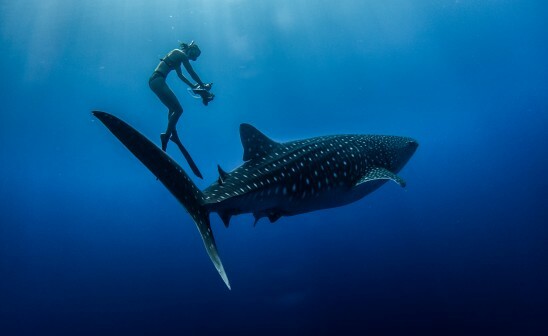 I have worked with whale sharks for the past few years at home in Australia, in both tourism, and research/conservation, on the Ningaloo Reef, a place that leads the way in whale shark tourism. Teaching people about their importance in our ecosystems and their struggle against extinction due to anthropogenic pressures such as overfishing, being targeted for their fins, and falling victim to plastic pollution. Before this trip I hadn’t seen a whale shark anywhere else, and have been intrigued to see how things were run elsewhere. After steaming for 4 hours, we arrived at a small boat with winged platforms in the middle of the ocean far from anywhere. With very fine nets dropped into the water periodically around the full moon, a fisherman would live out here for a month, in a tiny wooden hut on the boat the size of a normal household toilet, and fish for the month. The whale sharks were attracted to the organic matter that was ground up and falling off the platform into the water, they swam around under this set up, filter feeding on whatever was around, and then diving. The Indonesians told me about how they call them the “ Star Sharks". In a place where many people would easily resort to accepting more money to catch, kill and sell these animals fins, these fisherman have chosen to live in harmony with these animals, and let the odd few tourists who come by every once in a while, jump in and swim with them. There was around 7 whale sharks when we first jumped in, and we spent about 2 hours in the water with them. I was thrilled to see not one piece of plastic floating by during this time.